Culinox of Switzerland is long known for their high quality wares, and this fabulous Fish Poacher is no exception. All pieces are present. 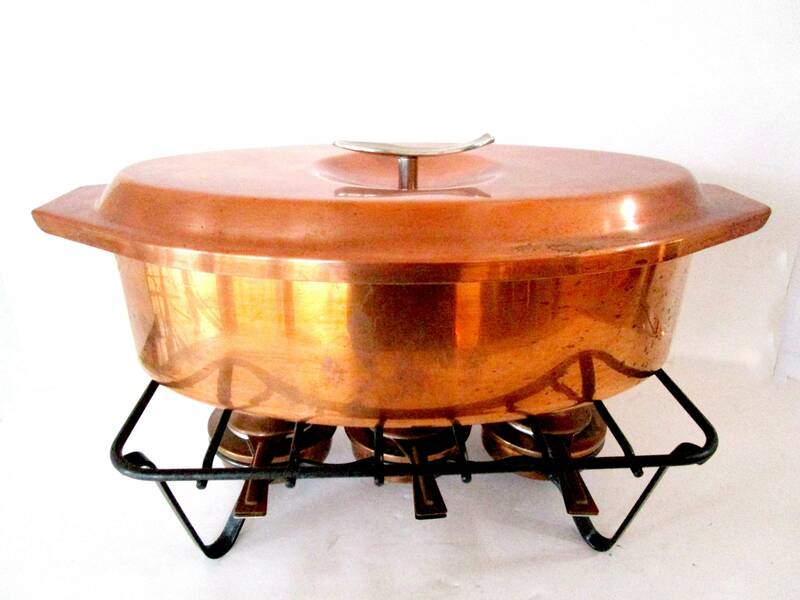 The pan, the elevated interior rack with handles, the lid, the burner stand, and all three original burners with lids, the embossed reindeer on each. Very large, the piece measures 17 inches across by 9 inches. The entire set, when on the burner stand is 9 1/2 inches high. In very good condition, the interiors are excellent. The exterior copper has some signs of age and storage, some spotting, tarnish, some light scratches, etc. Absolutely no dents. All three burners appear to have never been used, complete with lids also. You will not be disappointed. This high quality set can be used for a lifetime, strong, sturdy and sits straight and true.